Another good supply of cattle sold to a superb trade. Fat cows: M and K Blee, Donemana 695kg, £165, John McBride, Plumbridge 565kg, £158 640kg at £122, James McBride, Glenmoran 770kg, £156, 795kg, £154, 890kg, £137, Brian Dooher, Donemana 645kg, £156, D McIlwaine, Letterbratt 775kg, £142, M Morris, Glenhull 740kg, £126, T and M Dooher, Donemana 690kg, £126 660kg, £152. Friesian cows sold from £70-£100. R and V McGarvey, Plumbridge 755kg, £1,300, C Muldoon, Castlederg 590kg, £1,190, 600kg, £1,125, £1,100, 580kg, £1,170. A Armstrong, Dromore, 480kg, £940, 445kg, £970, 460kg, £960, 425kg, £835, 525kg, £860. E and C Baxter, Drumquin 465kg, £930 425kg, £880, 395kg, £830. W Deasley, Dromore 385kg, £880 360kg, £820, 450kg, £830, David Crosbie, Omagh, 385kg, £860. D Ballintine, Glenhull, 445kg, £855 405kg, £810. K McCullagh, Greencastle. 225kg, £555. W Deasley, Dromore 495kg, £870, 440kg, £720, C J Hall, Artigarvan 490kg, £840, 395kg £780. 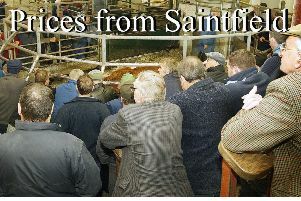 A local farmer 33.3kg, £120, 25.5kg, £100, K Quinn 27.5kg, £106.50, D McIlwaine 26.3kg, £105, 22kg, £94, E Darragh 28kg, £105, S and A Conway 28.2kg, £105, R Robb 30kg, £105, K Walsh 25.75kg, £104, B T McGlinchey 26.3kg, £101, Norman Coulter 23.8kg, £100 and L McFarland 26.5kg (horned), 23.5kg, £93.50.